A1CF, a complementary factor of APOBEC-1, is involved in many cellular processes for its mRNA editing role, such as cell proliferation, apoptosis, and migration. Here, we explored the regulatory function of A1CF in Wilms tumor-derived cells. Quantitative real-time PCR was performed to detect the mRNA level of A1CF, Axin2, β-Catenin, CCND1 or NKD1 in A1CF-depleted or A1CF-overexpression G401 cells. Western bolt was used to analyze the expression of A1CF, Axin2, and β-catenin protein. The cell apoptosis and migration ability were determined using flow cytometry assay or wound healing, respectively. Our study demonstrated that overexpression of A1CF, Axin2 was upregulated and knockdown of A1CF decreased Axin2 expression at mRNA and protein levels in G401 cells. Besides, knockdown of A1CF further upregulated β-catenin, the classical regulator of Wnt signal pathway, and increased CCND1 and NKD1, the target genes of Wnt/β-catenin. Furthermore, overexpression of Axin2 partly rescued the expression of β-catenin in A1CF-deficiency stable G401 cells. 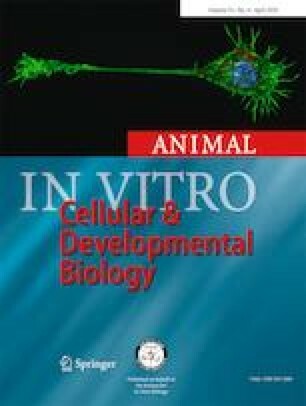 In Wnt agonist BML-284 treated G401 cells, A1CF was increased like other classical regulator of Wnt signal pathway, such as Axin2 and β-catenin. Meanwhile, knockdown of Axin2 rescued β-catenin expression which was decreased in A1CF overexpression condition with BML-284. Further, overexpression of A1CF reduced cell apoptosis but promoted cell migration, and overexpression of Axin2 got similar results. In A1CF-decreased stable G401 cells, overexpression of Axin2 partly rescued the cell apoptosis and migration. 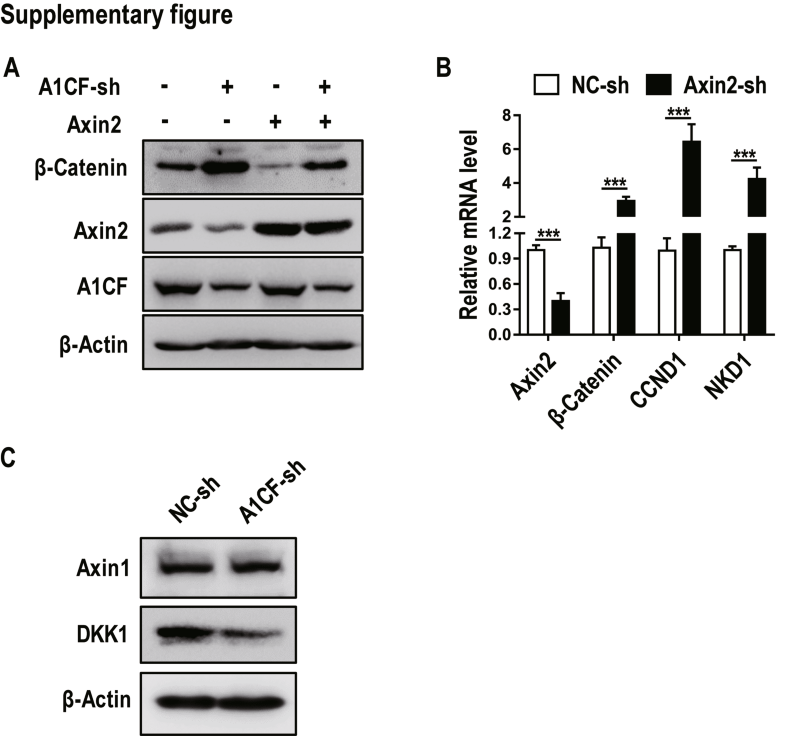 We find that A1CF is a positive regulator of Axin2, a Wnt/β-catenin pathway inhibitor, and A1CF-Axin2 signal axis regulates Wilms tumor-derived cells’ apoptosis and migration through Axin2. The online version of this article ( https://doi.org/10.1007/s11626-019-00335-6) contains supplementary material, which is available to authorized users. The authors are grateful to all the fellows in the Division of Molecular Nephrology and the Creative Training Center for undergraduates and graduates, the M.O.E. Key Laboratory of Laboratory Medical Diagnostics, the College of Laboratory Medicine, Chongqing Medical University. This work is funded by the National Natural Science Foundation for Young Scientists of China (Grant No. 31701218) and the Basic Science and Frontier Technology Research Program of Chongqing Science and Technology Commission (Grant No. cstc2017jcyjA0390) by Yajun Xie Ph.D.